A new study released Monday confirms a giant spike in the number of high school students who are vaping, and it finds many may not realize they’re almost certainly inhaling highly addictive nicotine. The annual survey of substance use among high school students shows 37 percent of seniors have tried vaping, up from just under 28 percent in 2017. Nearly 21 percent of seniors said they had recently vaped in 2018, compared to 11 percent in 2017. 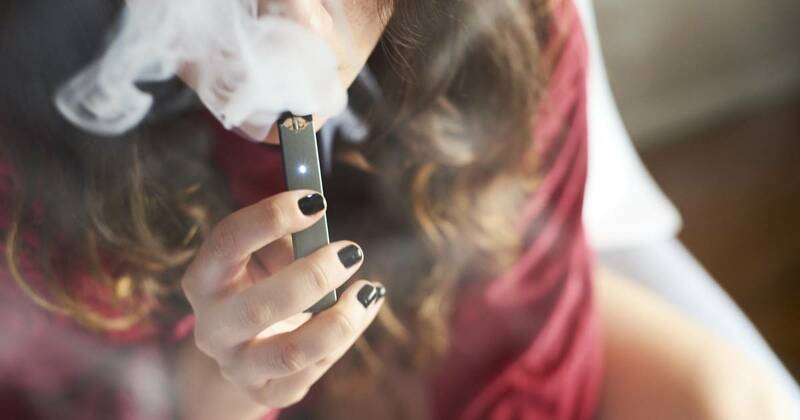 The findings are similar to startling figures released by the Centers for Disease Control and Prevention last month, which found a 78 percent increase in e-cigarette use by teens in just a year. The increase was so worrying that the Food and Drug Administration announced a series of actions aimed at cutting underage access to vape products. The latest survey indicates that students may not realize they’re using an addictive substance. More than 25 percent claimed they vaped “just flavoring” in the past year, up from 20.6 percent in 2017. But Compton said students may not really be checking. Most vaping products contain nicotine and Juul, by far the most popular e-cigarettes product, does not offer nicotine-free flavors. “The kids are telling us they’re just using flavorings, but they may not know,” Compton told NBC News. Other studies have shown people claim to be using nicotine-free products when in fact they are not. “So we’re not so sure that when they say they’re just using flavorings that they really know what’s in them,” Compton said. Several studies have shown that teens who use e-cigarettes are more likely to also smoke what’s now called combustible tobacco — old-fashioned cigarettes. And there is a growing body of evidence that these are not simply kids who are vaping instead of smoking. Surveys indicate many kids move back and forth between vaping and smoking. “One of the biggest risks that we do know is that when kids start with vaping, they are more likely to make the transition to combustible, to smoked cigarettes. So that’s really what has all of us concerned. We know the dangers from smoked, combustible tobacco,” Compton said. Experts worry that the high nicotine content of vape products may be addicting a new generation of tobacco users. “These results indicate that the policies in place as of the 2017-2018 school year were not sufficient to stop the spread of nicotine vaping among adolescents,” the team led by Richard Miech of the University of Michigan wrote in a letter to the New England Journal of Medicine, released along with the report. There’s good news in the annual Monitoring the Future survey, which the University of Michigan conducts every year on NIDA’s behalf. This year, 44,482 students from 392 public and private schools took part. Only 3.6 percent of high school seniors reported they smoke cigarettes daily, compared to 22.4 percent 20 years ago. Fewer students are using opioids, also — a direct contrast to the rest of the population. Misuse of opioids and opioid deaths have reached record numbers among adults aged 21 to 65. Less than half of one percent of 12th graders said they used heroin. Just 17.5 percent of 12th graders said they had been drunk in the past 30 days, down significantly from 26 percent in 2013, the survey showed. Under 14 percent said they had been binge-drinking, defined as having five or more drinks in a row. That compares to more than 31 percent in 1998. However, students are using marijuana, and many see it as safe. This reflects attitudes among people their parents’ age: As more states legalize the recreational use of cannabis, more people say they believe it is safe and natural. The survey found 36 percent of seniors used marijuana at least sometimes, and close to 6 percent said they used it daily. “That means 2 or 3 kids in the typical class around this country are using marijuana on a pretty much a daily basis while they’re in school,” Compton said. That’s concerning. Studies show cannabis use can affect a developing adolescent brain. Erika Edwards is the medical news producer and reporter for NBC News Channel, based in Charlotte.